The study’s author says Seattle’s parking spaces are actually increasing, even though drivers may not readily notice. Many spaces are being added in parking garages and underground. That’s more than two spots for every person in the city. It’s more than five parking spots for every household in the city. The total value of those spots, factoring in land costs and assuming each spot in a garage costs $50,000 to build: nearly $36 billion, according to a new study. Seattle continues to grapple with how big a role cars should play in getting around the city, and how much space we should devote to storing them. But the fact is that despite parking shortages in some specific areas, on the whole there’s a lot of spaces out there. So why can’t you find a spot? Part of the answer may be either that the spots are private or that you’re not willing to pay. Seattle stands out among the cities in the study for having an extraordinary amount of parking in garages — both private and public. Seattle’s total parking inventory comes from a new study by the Research Institute for Housing America, a nonprofit research arm of the Mortgage Bankers Association. The study isn’t shy about its policy goals — they want it to be easier to build more development and more housing without also building more parking. The study claims to be the first ever complete parking inventory for five U.S. cities. Cities, Seattle included, have inventories of paid parking spots and city-owned garages. They may have inventories of regular on-street parking or private lots. But, the study says, there previously had been no publicly-available inventory of how many total parking spots are in a given city. Seattle, Scharnhorst said, knows the most about its parking inventory of any of the five cities he studied (the others were New York City; Philadelphia; Des Moines, Iowa; and Jackson, Wyoming). 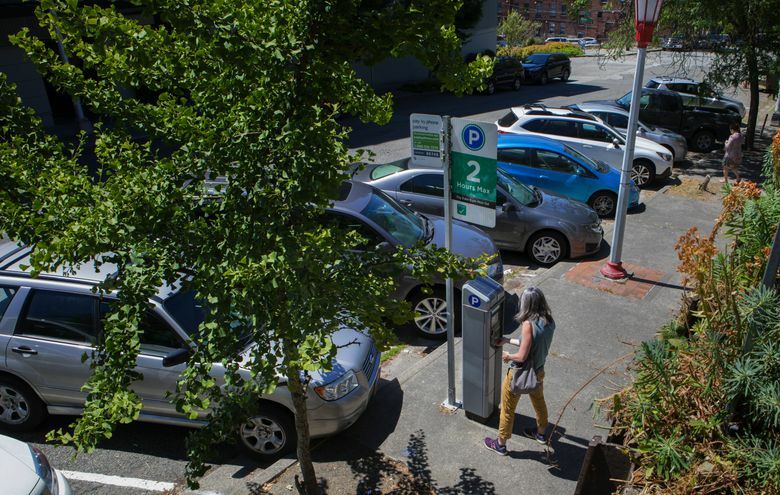 The Seattle Department of Transportation (SDOT) has specific data on its 12,000 paid on-street parking spots, and it has previously made rough estimates that about 500,000 on-street parking spots exist in the city. But on-street parking, according to the study, is slightly less than one-third of the parking in the city. The rest is in parking garages, driveways and surface parking lots, which SDOT has little to no data on. The city doesn’t know, for instance, how many parking spots there are at the University of Washington, how many parking spots are in Fred Meyer parking lots, or how many parking spots are in homeowners’ driveways and garages. Parking remains a hot issue in Seattle. Protesters and supporters alike packed City Council chambers in the spring, when the council voted to make it easier to build new housing without building new parking spots. Scharnhorst compiled his total by combining various databases from SDOT, the King County Assessor’s Office and the UW, with high-resolution satellite imagery of the city. He said that in Seattle, specifically, we continue to build more parking even when it looks like we’re doing the opposite. South Lake Union, for instance, used to be a warren of warehouses and surface parking lots. Those parking lots have almost entirely disappeared. But that doesn’t mean there’s less parking than there used to be. One example: The parcel of land at the corner of Denny Way and Boren Avenue was once a surface parking lot (used by Seattle Times staffers) with a couple of hundred spaces. That parking has disappeared and in its place two towers are rising that will eventually have nearly 1,200 apartments with ground-floor shops and restaurants. But the site also will have seven levels of below-ground parking with nearly 1,400 parking spots. The larger and denser the city in the study, the fewer parking spots per household it had. New York, for instance, with a population 12 times larger than Seattle’s, has just 23 percent more parking spots. But Seattle stands out in how much space it dedicates to parking garages — more than any of the other five cities in the study, especially in the most expensive parts of the city. New York City has about 356,000 parking spots in garages. Seattle has about 522,000 spots in garages. Scharnhorst praised the recently passed Seattle parking legislation that requires apartment buildings to “unbundle” parking from rent, allowing tenants to turn down parking.